You can earn 140 yards with this purchase! Shows virtually no traces of wear and is nearly impossible to distinguish from new. May show signs of very minor "shop wear", but in most cases, you'd be hard pressed to tell the difference from new... we just have the luxury of a super-duper magnifying glass! 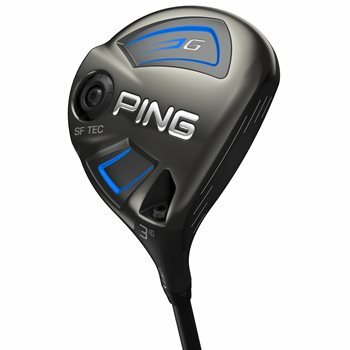 The Ping G SF (Straight Flight) Tec Fairway Wood is Ping’s best fairway wood yet due to its advanced aerodynamic Turbulators which increase club head speed and its easy alignment design. The SF Tec has been custom engineered for players who struggle with a fade or slice. By moving the weight closer to the heel, having a lighter shaft and having higher lofts, this fairway wood will influence a right-to-left shot bend (or left-to-right for left handed golfers). This fairway wood has been upgraded by lowering the leading edge so that it sits closer to the ground and moves the impact area higher on the face, giving you a more ideal launch with more forgiveness on miss hits. The Carpenter 455 face and multi-tiered internal sole construction are additional features that increase face deflection, allowing you to launch it higher and farther for ultimate distance and confidence. Review by average golfer, 10 months ago. Review by average golfer, 5 months ago.